Christmas. A time of good cheer, families, gifts, food and unbelievable traffic congestion. Or at least, this last item was evident this on Christmas Eve morning when I went to the fish market to pick up our Christmas seafood. Cars everywhere, cops directing traffic, chaos in the car park. Really, why do people put themselves through it? I felt suitably smug wending my way through the traffic into the fish markets; no need to queue, no need to sit in a traffic jam, no need to pay to park. On the way in, I met a friend, also on his bike. The queues, though, were not just in the traffic lanes. People were queuing outside the retailers to get in. Having successfully avoided the queues to get into the place, how could I avoid these ones too? My friend wanted to go to a particular shop, so joined the queue winding out of the door and across the car park. Trying to be clever, I checked out the various retailers, and chose the one that seemed least busy in terms of people inside – Nicholas Seafood. Walked in the back door, found an assistant, and picked up what I needed. Result! Got served in under five minutes. Had to queue up at the till to pay, but that was only another five minutes or so, so everything was looking great. At this rate, I’d be in and out in the time it was taking those poor car-bound motorists just to get into the car park. Paid for my fish, and then queued up at the collection counter. It quickly became clear why Nicholas Seafood was serving customers quickly at the front end; their process clearly was designed to maximise the number of people they took money from, rather than the number of people who actually walked out with seafood. The system worked like this. Each receipt had a number written on it (mine was ‘L20’). As each order was completed it was put in a bag with a matching number on the receipt inside. Those bags were then haphazardly piled up on the counter. An small army of cheerful girls then attempted to match the numbers on the receipts clutched by the (increasingly unhappy) punters with the ones inside the bags. The pile of bags just grew and grew. There was no way of knowing whether my bag was actually in the pile. Nonetheless, an assistant gamely checked dozens and dozens of bags, opening them all to look at the number inside. They couldn’t find my number. There must have been fifty people in the queue waiting; perhaps fifty identical plastic bags piled up on the counter; seafood spilling out of them as they were checked over and over again; the poor assistants swarming around them vainly looking for specific numbers buried in the mountain. And still more and more bags were being piled on top. It was an amazing sight. I wish I had taken a photograph; the absurdity of the system was hilarious. Myself and the guy next to me just got a major attack of hysterics about it. ‘This is freaking hilarious’, he said, wiping tears from his eyes. ‘This has absolutely made my Christmas!’. The Spicy Fruit Roll contains 45% ‘real’ fruit. I’ve always wondered about this. Are there biscuits out there that contain artificial fruit? If something was simply labelled ‘45% fruit’, should I be cynical and suspicious and assume the fruit is counterfeit? Either way, we can rest assured in this case, as the Spicy Fruit Roll contains raisins, sultanas, and currants, as well as citrus peel. And the difference between raisins, sultanas and currants, as you all know, is that raisins are dried grapes, sultanas are married to sultans and currants are what flow around electrical circuits. <Boom tish>, I’m here all week. 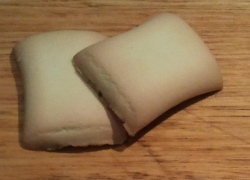 The biscuit consists of a fairly soft outer ‘roll’ that is crimped at the edges. The amount of filling is, I think, slightly less generous than depicted on the packet, but the balance of filling to biscuit is about right. So what do they taste like? In a word, they taste like Christmas. You know; log fires, carollers, mulled wine and so on. There is definitely spices going on there – perhaps nutmeg and cinnamon. And there’s also something else; a hint of aftershave, perhaps, that actually enhances the evocation of Christmas. They are not a seasonal line and are available all year round, but I have to say eating a Spicy Fruit Roll in, say, August, would be a discombobulating experience. So I would give them an eight out of ten in December, but only a four out of ten for the rest of the year. The Granita is kind of the flash cousin of the Shredded Wheatmeal. 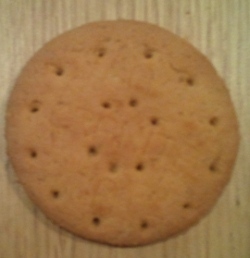 It’s a digestive biscuit, and it includes whole wheat. However, it’s much sweeter and less worthy that the aforementioned biscuit, and requires much less chewing. It’s quite crumbly, and indeed this feature is exploited in cooking, as the Granita is the preferred Australian biscuit to use to make a cheesecake base. Mrs Chillikebab, despite my exhortations, continues to buy very expensive imported McVities Digestives for this task. You can take the girl out of the UK, but you can’t mess with her cheesecake. Although I have to say Mrs Chillikebab does make a mean cheesecake, so perhaps I shouldn’t complain too much. Now, at this point I have a confession to make. When I reviewed the Chocolate Wheaten, I airily declared that it was, in fact, a chocolate coated Granita. Well, I’m not too proud to admit I was wrong. My memory was obviously deceiving me (and my only defence is that I hadn’t had a Granita for quite a while when I sampled the Chocolate Wheatens) as they are different. Not much different, to be sure – but the Granita contains flakes of wheat which are not present in the Chocolate Wheaten. Which is kind of ironic, when you think about it. 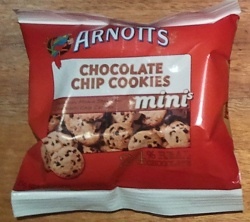 Oh well, you live and learn; I should have trusted the integrity of the Arnott’s naming conventions. What else is there to say about the Granita? Well, like many biscuits of this style it dunks very well, although you do need to ensure you don’t hold it in the tea too long, as it can crumble away as the tea waves erode the soft surface. It is stamped with the word ‘GRANITA’, along with two ‘A’s, presumably for Arnott’s. And it was introduced, I am reliably informed, sometime in the 1960s. It’s actually quite a tasty biscuit, in a plain sort of way. I’d give this an eight out of ten. Mechanical problems come in threes…? The other day, when leaving work at some ridiculously late hour, I got about a hundred metres down the road and realised that I had a puncture. I was riding the Peugeot, and it has brand new tyres on it. ‘Bombproof’ is how they were described by the shop. Well, either I have a problem with those rims or Panaracer tyres are not all they are cracked up to be; I’ve done nearly 10,000km on my beloved Conti UltraSports on the fixie and never had a puncture. Then today, I had another problem. Pulling away on a hill at some lights with a queue of cars behind me, and suddenly it’s really hard to pedal. I mean really hard. Hard like ‘the back wheel just seized up’. I hobble to the side of the road amidst the blaring car horns to work out what has gone wrong. The first thing I realise is that I’ve somehow got into the dreaded ‘little-little’ combo. I have no idea how; I never use the granny ring but for some reason I’ve absent-mindedly clicked the left hand gears. On further inspection it seems the brakes have jammed on. How can that happen? Seems very odd. I try to release the catch thingy you use when taking the wheel off, but it’s already off. So the brakes should be as wide as, but are in fact jammed against the rim. Very weird, I’ve never had brakes jam on before. I look a little further, and see the cause of the problem. The pressure of puling away coupled with the little-little combo has put a lot of lateral pressure on the axle, and it has slipped in the drop-outs. This has also caused the brakes to jam up on one side. I release the skewer, re-centre the wheel and things seem to work again. I get the gears into a more normal configuration, and take my place back in the traffic, ironically back at the head of the queue waiting for the next cycle of the lights. They go green, and we go again. But actually we don’t go again, as half a pedal revolution in, once again that dragging feeling and I grind to a halt. Another embarrassing hobble to the side of the road. ‘Perhaps I should have tightened the skewer’, I muse, as I once again adjust the wheel back into the centre. I start out again, but something is still not right and the brakes are rubbing. It’s no good, I can’t see what I’m doing with panniers etc on the the bike, so I take them off and turn the bike upside down on the pavement. 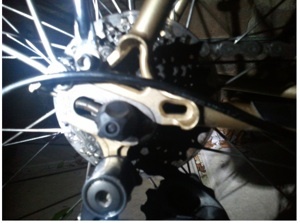 Seat the wheel properly, centre the brake calipers, get the chain running smoothly on the gears. Finally, it seems all is well, and I am able to continue on my way. After reviewing both the White and Dark version of the Tim Tam, I have been under some pressure to look at the original version. Several Tim Tam aficionados have told me, often in no uncertain terms, that they are the absolute finest Tim Tams, and my neglecting of them is a travesty, and perhaps even a Crime Against Australia. They are wrong, of course; the Dark Tim Tam is the best one. However, I was recently given a pack of Tim Tam originals, so thought I would take the opportunity to look at them. It wasn’t just a regular pack that I was given, but a much larger ‘Value Share’ pack. At first glance, this looks like a double pack of Tim Tams. However, this isn’t quite the case. 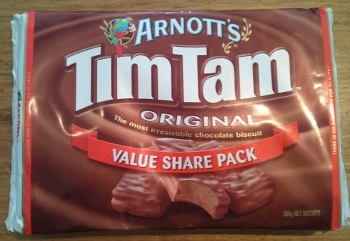 Single Tim Tam packs contain eleven biscuits, but the ‘Value Share’ pack contains twenty. 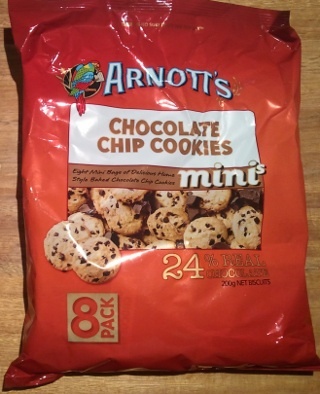 Now, a more cynical person may conclude that Arnott’s are attempting to pull the wool over the consumers’ eyes, seeking to create the impression that this is a cheap way to buy two packets, whilst in fact short-changing them to the tune of two Tim Tams. However, I am not that cynical, and think that actually Arnott’s are simply ensuring that the name of the pack can be lived up to – it is a ‘share’ pack, after all, and twenty divides much more neatly into portions (of two, four, five and ten biscuits) than would a pack with twenty-two (which would only divide into two or eleven). These are the biscuits which set the pattern for TimTamness; namely two cocoa-flavoured biscuits sandwiched together with chocolate cream and then enrobed in milk chocolate. The biscuits are quite crumbly, and the cream filling quite generous, with a good chocolate coating – they are quite an indulgent treat. But this is where the Ori ginal falls down against the ‘Original Dark’. Yes, it’s a delicious biscuit. However, it’s just too sweet. Even when taken straight from the fridge, you find yourself thinking ‘oooh, I must remember to put these in the fridge’, because they have that slightly too sweet and sickly effect that you get with room temperature chocolate. It’s not bad, but if you eat a whole packet of these, you tend to feel a bit sick – unlike the dark variety, which slip down a treat. So, where does that leave us? Well, the Tim Tam Original is a very nice biscuit. It’s not quite as nice as the Tim Tam Dark, but is nicer than say the Monte. And it’s much nicer than the execrable Tim Tam White, although that’s no real feat. I left work very late today, and when I came to hop on the bike outside the office, I discovered one of the rear lights wasn’t working. Aaarg! Batteries? Of course, I have a spare set in my bag, so switch them over. Nope, still no joy – seems the light is dead. I had a nasty feeling about this light after I last used it – which was a long ride in torrential rain. It wouldn’t switch off properly, and it seems it no will no longer switch on again. Why do bike lights cope so badly with wet weather? It’s a decent light from a reputable bike shop, but they just don’t seem to be built for the rain. Very frustrating. My other working light gives me cause to celebrate my ‘two lights per bike’ strategy though, so I set off. Ironically the working light is an old cheap one that seems to withstand the rain quite OK.
Mrs Chillikebab has already warned me there’s is no food in the house (and that’s literally true, as everything is packed up for the impending house move), so I need to pick something up on the way home. 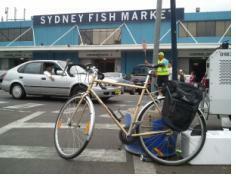 I decide to ride home first, then get something to take home, so ride to Rozelle. I’m pretty hungry by this point, and spend a large part of the journey wondering what to get. Thai? Indian? Pide? I’m not too hungry to enjoy the ride though, even going on a bit of a scenic detour through The Rocks. It’s a lovely night for a ride; quite warm and still. After a long stressful day at work, it’s the best way to unwind. I’m also riding the Peugeot, which I haven’t ridden for a few weeks, and there’s something nice about reacquainting yourself with an bike you haven’t ridden for a while. It seemed happy to be out of the shed too; bowling along really well coupled to my shiny white shoes! What to do? I continue on a little way further, and am met by the welcoming sign of the pizza shop. Not my first choice, but by this point I’d eat anything. Except McDonald’s. I order at the counter, and he tells me it will be 10 minutes. I kill a couple of minutes looking in the window of the bike shop next door, but then decide to use the time by riding up to the ATM. I hook my bike lock over the handlebars and set off. I’m on Darling St when a car with a stupid farting turbo guns the engine behind me – and sure enough whizzes past too close when there’s traffic coming the other way over a humped intersection. It’s a 40kph zone, and he’s not going to get anywhere, but I suppose he needs to compensate for his inadequate manhood somehow. As he goes past, I feel the tyre catch something that spits out, and just catches my leg. ‘Bet that was a stone pushed into my path by that stupid car!’ I think uncharitably as I pull up at the ATM. I go and pick up my pizza and head home, thinking of the now two replacement lights I need to buy. 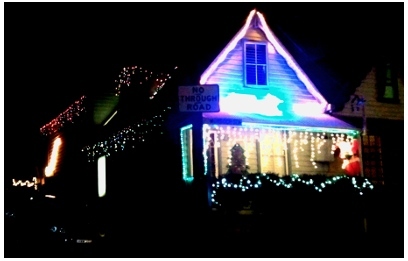 However, approaching my street I encounter a whole bunch of houses with their Xmas lights up on display all looking very jolly. Hey, what are two lights when there’s hundreds more to be enjoyed? Much cheered up, I turn into home to scoff my late night pizza. Today, I bought new cycling shoes. I’ve been needing a new pair for a while; I always know when my shoes are wearing out as my right knee starts to ache sometimes on longer rides. But actually that wasn’t what tipped me over the edge; what really did that was the smell. We’ve had a lot of wet weather recently, and my old shoes stank. Really really stank. I had them under my desk at work, and it smelled like a tom-cat had pissed on the carpet. I had to move them out of the office, it was so bad. Worse than a teenagers bedroom. The time had come – I needed some new shoes. So at lunchtime I headed out to my favourite bike store, and tried on some shoes. Now, I’m not a real roadie type. 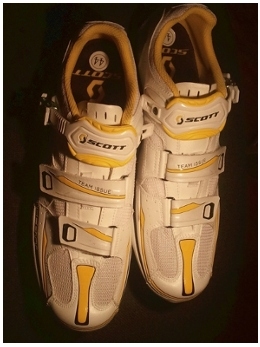 However, I do like SPD-SL cleats. They just feel much more comfortable than regular SPDs, and on the fixie I appreciate the comfort and the power transfer when grinding up the big hills. I also find them much easier to align than SPDs (which I also use, on my tourer). So I wear clip-clop roadie shoes when riding the fixie, even if they are sometimes a big incongruous with the rest of my commuter outfit (I do wear full lycra often enough, for example for a longer ride, or if it’s raining. It’s very practical, after all). Up until now I’ve stuck with basic entry level shoes in black. Easy and low profile. However, the guy in the store was an absolute master, and I was putty in his hands. Was a carbon sole better? Oh yes, no doubt. Much stiffer for longer. He stopped using anything else five years ago! Definitely worth it; absolutely no doubt I would feel the difference. I would be able to get better power transfer and go faster. And there was 20% off that model. But they were white. A bit, well, bling, don’t you think? Oh no! Very stylish. And you’re riding a bike – you don’t need to wear school shoes! But this cheaper black pair are very comfortable. Oh yes, they are very comfortable. A nice shoe. But not in the same league. They are fine, sure, and will do the job for you, but they won’t be a stiff for as long, and you’ll notice the difference. I really recommend the carbon fibre. I bought the white shoes. I have no idea why. I went into buy another pair of entry-level black shoes, and came out with a white carbon fibre pair that were twice the price. I mounted the cleats on them for the ride home in some anticipation. Would I feel the exceptional power transfer? Would I be faster? Would my feet smell less? In the end it was a bit hard to tell. The cleats weren’t quite in the right place, and rather annoyingly the bit of the strap that sticks out on the inside was catching on the crank each time the pedal goes round (I like to have my feet close together, so tend to mount the cleats right on the outside of the shoes). Hopefully I can solve this by shortening the strap and re-aligning the cleats. I did successfully fend off two roadie competitors on Anzac bridge, so I guess they worked OK. Still, some purchases you love straight away, and some you come to love. I think these shoes fall into the latter category. Perhaps I’ll like them better when they start to smell a bit. The Shortbread Cream. A biscuit that harks back to Arnott’s Scottish heritage, consisting of two shortbread biscuits (baked with a mixture of butter and vegetable oil) sandwiched together with vanilla flavoured cream. 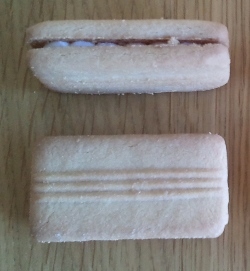 The biscuits have an attractive ridged line down the centre which give them a sort of Art Deco feel, and the cream filling really does have a scalloped edge as depicted on the packet. They were first introduced in 1908, so clearly the Arnott’s biscuit designers were ahead of their time with the Art Deco thing. They are made to an Arnott’s family recipe, and seem to be a very popular line. You can even buy then on Amazon.com, although only new, rather than second hand – although the out of date packet design shown in the picture does not inspire confidence that they are going to be fresh. T hey are quite nice; the shortbread crumbles nicely and melts in the mouth, and the cream filling adds a nice touch of indulgence. Yes, they are nice, but they aren’t great. There is not quite enough butter compared to vegetable oil, so they are a bit, erm, oily. And the cream filling doesn’t really live up to it’s billing as ‘vanilla cream’; it could do with rather more vanilla. Perhaps that’s being churlish; they are quite good and it’s quite easy to chomp through most of the packet in one sitting. I’d give these a seven out of ten.